Inside DC's Harvard Business School Global Networking Night! Last Wednesday night, we made our way to DC's fine dinning and jazz venue, the Hamilton, to attend the Harvard Business School Club of DC's Global Networking Night event! The evening's soiree brought out the best of DC's business men, women, and entrepreneurs, and we were lucky enough to get the details of this exclusive event! On Wednesday evening, October 22nd, we entered the Hamilton and made our way through the venue's florid dinning hall, traveling to the back of the building where we were then directed up the stairs to the Hamilton's secluded loft area for the evenings networking soiree. Having begun around 6:30pm, The Harvard Business School (HBS) Club of DC alumni and guests gathered at the Hamilton's Loft to strengthen and old bonds create new connections at the institution's Global Networking Night event (GNN). A tradition among alums as the premier event to explore new opportunities, Harvard's GNN is an HBS event held annually in cities all across the globe. But of course, our main focus was DC's HBS event right here in the nation's Capitol! The event began as GNN attendees walked the HBS red carpet and posed for photos before moving into the Hamilton’s executive loft. Inside the event, guests enjoyed hors d'oeuvres and decadent bites by the Hamilton's top chefs, and sipped on cocktails and exotic South African beers by African Gold Beverages while reconnecting with friends, old class mates, and creating new contacts. 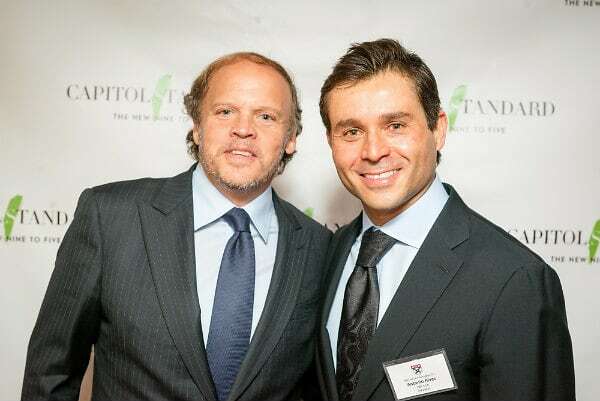 HBS president Antonio Alves attended the event and presented the evening's keynote speaker, local powerhouse investor and owner of the Washington Kastles, Mark Ein. Ein shared his personal insight on what he loved about District, how it has changed over the years, and why it is ideal location for HBS graduates to continue build and flourish. After the keynote address, a raffle was held for guests who had entered their business cards upon entry. A few lucky attendees won prizes such as fine wine, Kastles apparel, and a Preferred HBS Club of DC Membership worth $375! An intimate setting, the Hamilton served as a sophisticated back drop for this international HBS event. Impeccably exclusive, yet cosmopolitan. With over 100 alumnae and their guests, this year's HBS event was no doubt a networking success! We're looking forward to next year!